Good news over in Canada where BlackBerry has confirmed its latest handsets, the Z10 and Q10, along with its long suffering PlayBook tablet have undergone successful testing at the US Department of Defense's (DoD) labs. It was feared that the DoD had given BlackBerry the cold shoulder after it was revealed yesterday various Apple and Samsung devices had gained clearance for America's military. 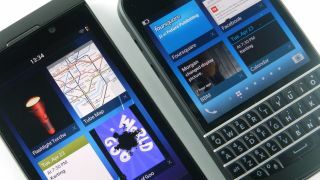 However the new-found approval for the first two BlackBerry 10 devices and the firm's only tablet means all three can now be considered for purchase by those working at the DoD. BlackBerry has long been the manufacturer of choice for the DoD and its 600,000 smartphone owners and this latest set of approvals will help it in the battle against the likes of the iPhone 5 and Samsung Galaxy S4. The BlackBerry Enterprise Service 10 has also been given the go ahead for use on DoD Networks, which will help the US government keep control of all the BlackBerry devices it has - ensuring security is kept tight. It's not clear which brand the DoD will favour, and it does currently use a mix of devices from all three manufacturers, with the current favourite being BlackBerry - but will it be able to hold onto its dominance?